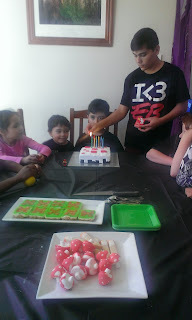 We have a plethora of birthdays over the May/June/July period in our home. Well, with six children it always seems to be somebody's birthday! 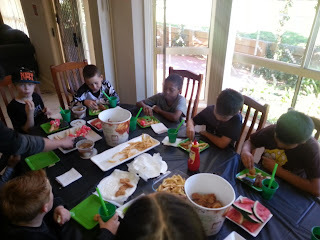 This year we gave in and let three of our children have birthday parties. Unfortunately for us, due to the ridiculously extravagent and over the top organisation, decorating and intense attention to detail of previous family parties...the expectations were high high high!! 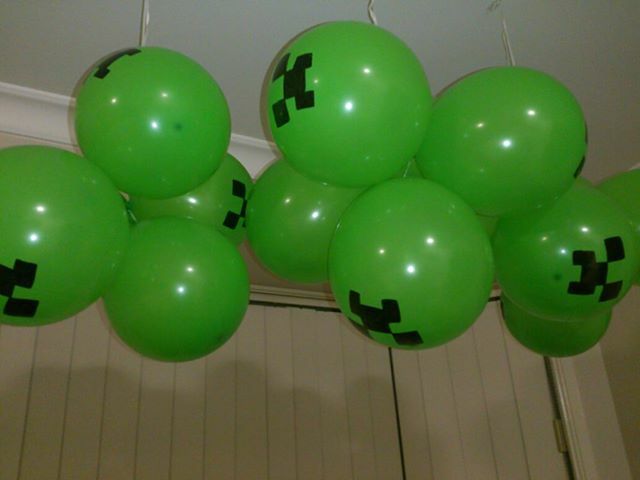 This party was going to be super fun. Lukey was turning 10 and hadn't had a party in at least four years. The latest craze for him is Minecraft. An online building/creating game. These were made using white electrical tape. 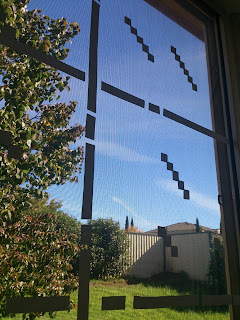 Simply cut the tape into strips and little squares and stick on your window...it looked AMAZING. It peels off easily enough...but after a few days leaves a bit of a sticky residue. Found this came off ok using a bit of cream cleanser and a sponge then cleaning with paper and window cleaner. Simply draw on creeper faces with black permanent marker. square plastic green plates and cups and giant fat green straws. We only had 10 kids so sat them all at places at the table. 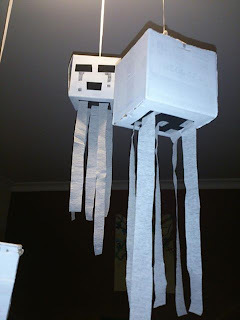 These sobbing little ghosty creatures were hanging in our living room which we created to be the portal the kids had to walk through to get to the party room. 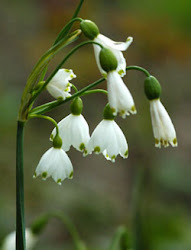 They were made from any little empty square boxes we had, painted white. used black electrical tape and coloured in with lead pencil the tears. simple crepe paper streamer strips underneath. Hung with string to the light fitting. So these are important because they keep away zombies!! 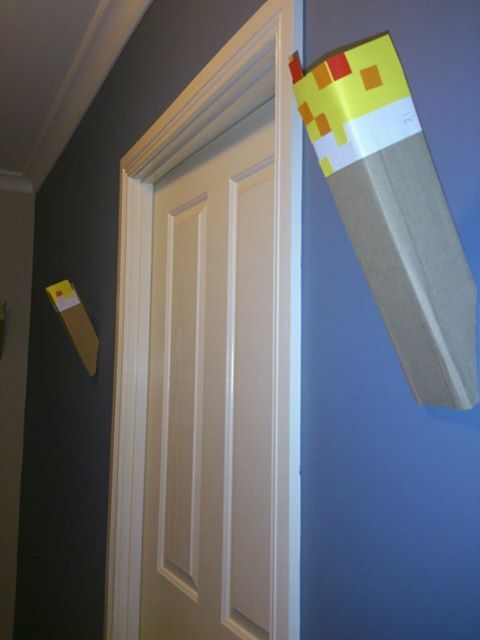 Made these just with bits of old boxes, white paper, yellow paper and bits of red and orange. I just folded it together and then 3M'd them to the hallway walls and they looked amazing!. This was ridiculously easy to make. You can buy crepe paper already fringed like this. then completely covered the box with two layers of paper mache (newspaper strips, flour and water glue). The added the white paper layer and decorated with little strips of black, grey, a black square on the bottom and white streamers. 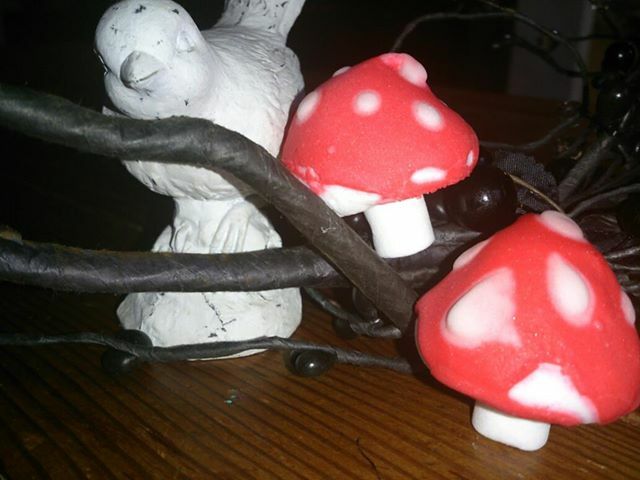 Cut a teeny flap in the top and filled with glow in the dark bouncy balls, wrapped lollies etc. The kids took turns rolling the dice and if they rolled a six, they quickly put on the head, and tried to chop chocolate into little squares and eat it. 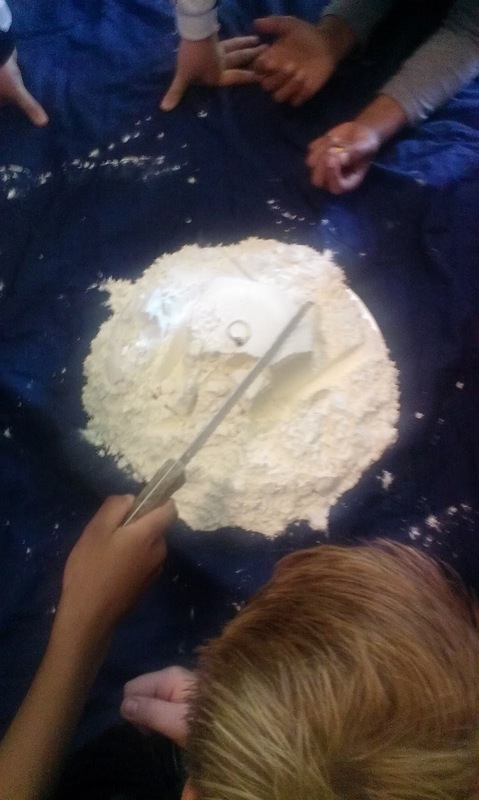 Press flour into a bowl and carefully flip over on to a big board so you have a dome of flour. Good to put on an old washable blanket or cloth. The kids take turns in the circle to gently slice a sliver of flour from the dome. As the dome gets smaller and smaller they get more nervous, so funny...MUST NOT let the ring fall in! 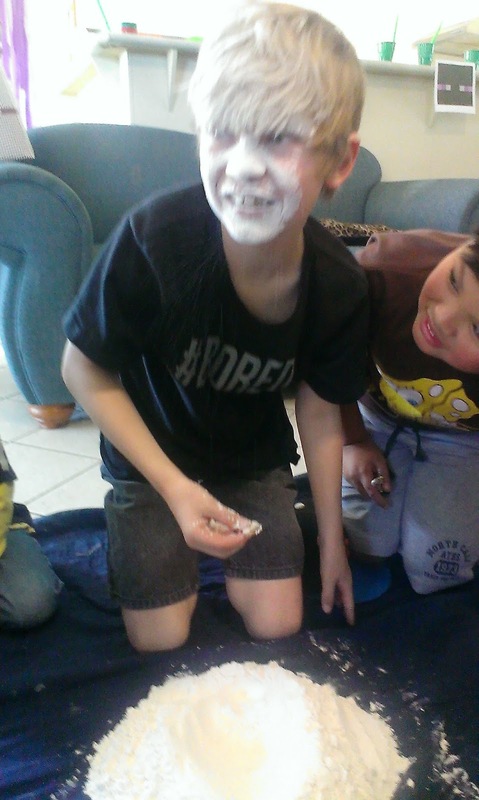 When the ring tumbles in to the flour, the child that let it fall in has to get it out...with their TEETH! The child receives a prize. The kids separate themselves so that one half of their team are at one end of the garden, the other at the other end. If their number is called they both run to the other end of the garden and retrieve a pencil off one of the chairs, run to the other end and throw it on the chair, repeat. Then they run to the centre and grab the rope .... hence tug of war... (will try to find the photos so this makes more sense) - first to their starting point gets a point for their side. My husband is the king of treasure hunts. 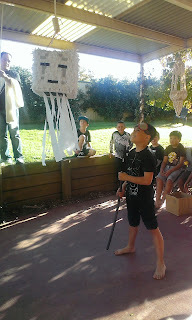 He wrote clever clues to lead the kids in their teams all around the garden. At each point they had to find their sword with their coloured dot and return to him for the next clue. They loved it and all worked well together. The winning team received prizes each. Play music, when it stops kids rush to one of the pictured corners and a piece of paper is drawn from a box (a tnt box in this case). Whichever picture is written on it, they are eliminated. Until only one child remains and receives a prize. 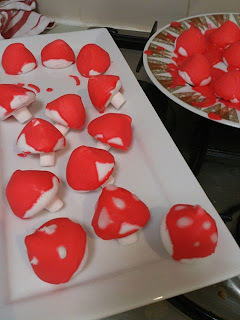 This was so much fun and really made the party! Basically, we just looked online and made food to match the game. 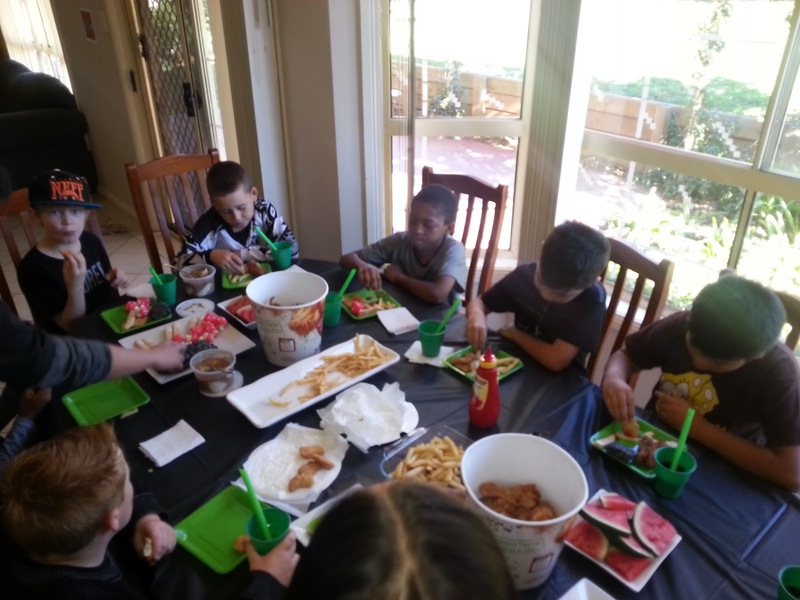 The game has chicken and potato so we just ordered a bunch of KFC chips and chicken as the kids all love that. Additionally, we made rice krispie treats coloured black for coal. Green jelly slice decorated with sour straps for creepers. 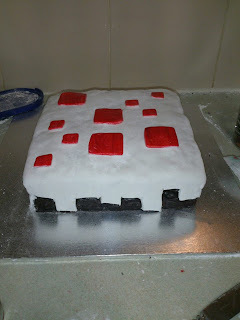 and finally the minecraft cake (which could have been a lot better, but the kids loved it) - simple chocolate mud cake, double layer with white fondant icing and painted fondant squares. Here you can see the green jelly creeper slice and the mushrooms and cookie torches. We made sure that every boy received at least one prize. The gift bags to take home were just green paper bags with creeper faces stuck on with electrical tape. I know this is from last year, but i would love to see some more pictures from some of the activities you did.